drooz doodles: up,up, up and away with summer. up,up, up and away with summer. thank you all so much for the wonderfully positive comments regarding my "blogger bully". I'm over it. I guess. For now. - and put all my crazed energy into new ideas and some serious weekend brainstorming for new designs. (my best weapon!) I have sharpened my colored pencils and I'm ready for battle! 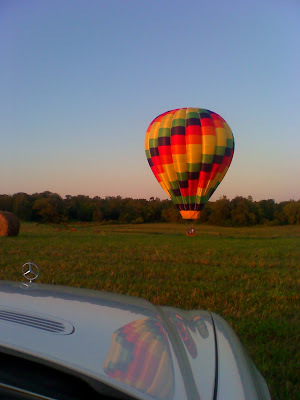 I also LIFTED my spirits by treating the family to a hot air balloon ride! do take a look! we decided to mark the end of summer with a balloon ride for the four of us. I had done this years and years ago and really enjoyed it. during the summer months a hot air balloon will float over our back yard about once a week... on one of these particularly lovely evenings my husband mentioned that it might be fun to take the kids some time... so we got him (ett hemm.. all of US) a gift certificate this past fathers day for a balloon ride for four. we finally cashed it in this saturday! it was a blast! 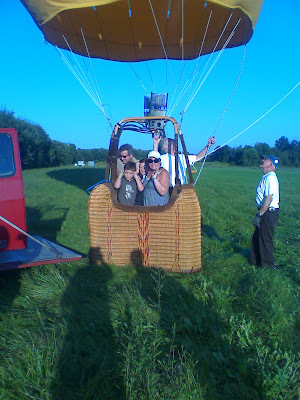 marc (hubby) and clark (son) help fill balloon with cool air from giant fans. me and chloe (daughter) enjoying the view. we spotted about 20 deer, lots of barking dogs and followed our "chasers" with our eyes the entire time. It is peacefully and calm... and so very quite. we could even hear the crickets from 1000 feet above. a perfecto sunset landing in a freshly cut hay field! I'm reading: up,up, up and away with summer.Tweet this! OMG! what a fun way to say up, up and away to summer! i would love for you to come and say hello. You guys do the coolest stuff! We don't get out much in our neck of the woods! !